Manufacturer of a wide range of products which include master square block. Master SquareBlock with the master block is made from selected black granite stone. Master squares are ideal for inspecting the X, Y and Z axes of machine tools. 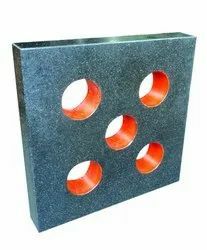 Our Square granite master block is very stable and rigid, providing the ultimate in squareness references. Our Granite square has 5 finished faces (1 large face and 4 edges) finished flat, square and parallel to Grade–0 accuracy. All six faces can be finished upon request. Looking for Master Square ?